'Nocturnals' Creator Dan Brereton: The Horror News Network Interview - Horror News Network - The Horror News You Need! 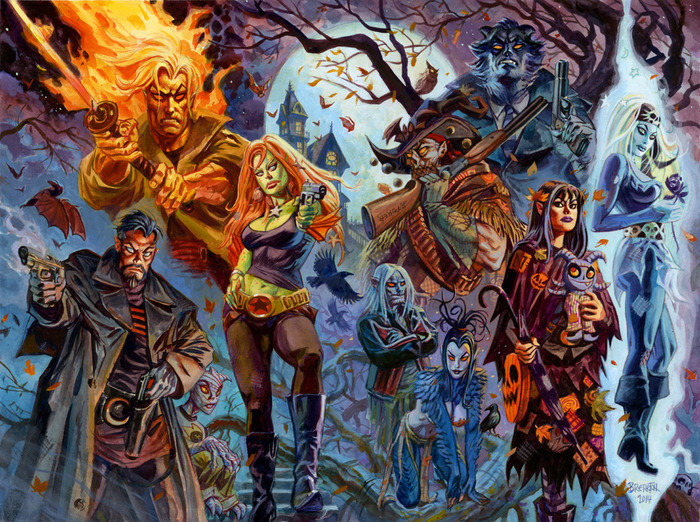 If you are a fan of monster comics and monster artwork , Dan Brereton should be no stranger to you. 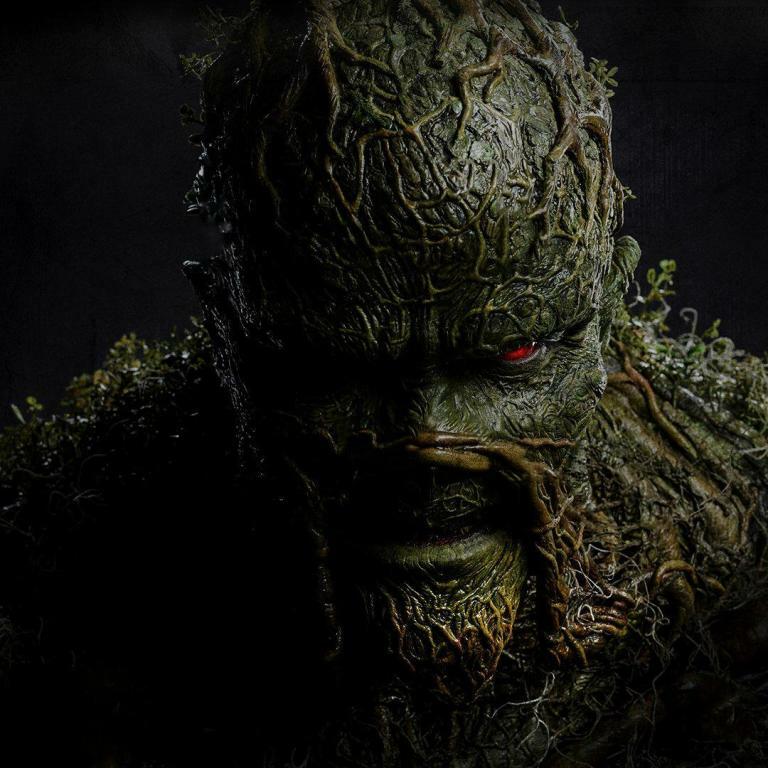 Whether it is through his beloved creator-owned titles The Nocturnals and Doc Horror, his work on Batman and Superman mini-series, or his cover artwork for Rob Zombie albums, his distinct style is one that has captured fan interest for nearly 30 years. While the artist continues to work in all aspects of the comics medium, in recent years, Brereton has taken his popular art books and comics directly to his fans through a number of wildly successful Kickstarter campaigns. Brereton took some time from his busy illustrating schedule to speak to us about his latest Nocturnals Portfolio project as well as many aspects of his long career, and a number of exciting future projects. Horror News Network: Where did the idea to create a Nocturnals portfolio come from? Dan Brereton: I first became aware of the art portfolio format back in 1980. From my high school my pal, Derrick, and I would walk to Bonanza Books , the local comic shop in Modesto, and they had three now-classic Frank Frazetta Portfolios there, under glass. The owner’s youngest son, Terry, was cool, and didn’t mind letting us look at them. Very cool considering they cost at least 100$ each at the time ! I became fascinated with the purely artistic presentation- the idea of a theme and focus on artwork. From the point-of-view of a kid who loved comics, but was not yet exposed to the idea of the artwork for its own sake, portfolios and art books were an eye-opener. The idea to present work in this format has always appealed to me . I was working on several large Nocturnals commissions from December to January, and it struck me how I now had material which fit the format . So I went ahead and painted and drew several more large pieces to fill out the package. It was a lot of work – but I loved every minute of it . I guess that’s just what happens when you catch the fever for something – you become energized- the labor is intensive yet joyful. HNN: Aside from all of the work you’ve done in the comic industry, why do you think the Nocturnals have had such enduring fan interest and why do you still enjoy illustrating these characters? Brereton: I never get tired of drawing them or thinking about them. Like any series , the ideas flow as you explore them. The Nocturnals have always embodied the aspects of what I’m fascinated with in terms of storytelling and drawing, subject matter and theme. Because they don’t necessarily adhere to a sole genre or mood, they’re very plastic and versatile. And I love drawing monsters. So I conceived a project where I could tell pulp-related stories starring a bunch of creepy monsters- and one nice little girl who loves Halloween. I think a lot of people, it turns out, relate to Evening (a.k.a. Halloween girl) and the escapism of how cool it would be to have a gunslinging zombie bodyguard. I’ve tried to make them human and not simply reduce them to archetypes, Mostly I just feel grateful there are people out there who like them as much as I do! HNN: You have had great success with many Kickstarter campaigns. Have you learned anything about the crowd funding model over the years? Brereton: You definitely learn as you go, as each mistake is a lesson. They aren’t huge blunders, but they can end up costing you money, time and effort. Mostly, I love the crowdfunding model because it puts you directly in contact with your client, reader, collector- and a community is formed around the project. The fact you can build upon the project itself as you go along, based on the success of your funding is also pretty exciting. We’ve already expanded the project because of this, at no extra charge to the backers. HNN: You are well known for you monster characters, but you have also done a lot of work with the greatest super heroes of all time. Do you have a favorite story or collection of your super hero work? Brereton: I think my grandest superhero project was The Psycho (collected as a trade paperback now available through Image Comics). This was a project I did only a couple of years out of Art school for DC and I filled it with as many superhero characters as I possibly could because we were building entirely new universe. At the time DC also was very interested in doing a monthly series after the initial miniseries came out (though it never came to pass) because of it, I pulled out all the stops. So when you see the book you’ll see dozens of characters fleshing-out that world, even if they don’t have an actual role in the story itself. My favorite superhero project was Thrillkiller with Howard Chaykin. Again this was a DC Comics project, edited by Archie Goodwin, who I pitched the project to with Howard in mind to script it. 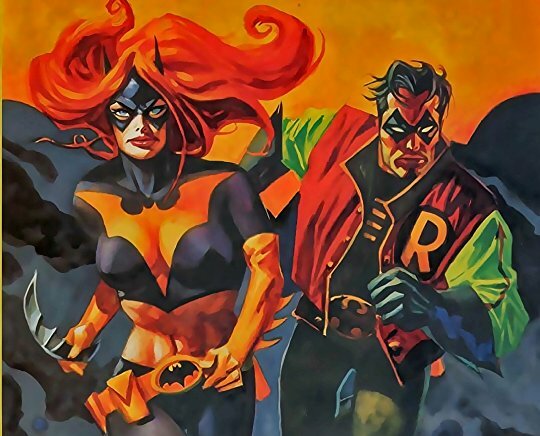 The story is set in an alternate timeline in the early 1960’s, where Bruce Wayne is a Gotham Police Detective, and Batgirl and Tobin are the dynamic vigilante duo. It’s being collected again as a trade paperback this summer. I’m really excited to see it coming back into print. We added a gallery of concept art, I wrote the afterword and Howard provided an awesome introduction. HNN: You have also done some notable album cover artwork for Rob Zombie. How did you initially become acquainted with him? 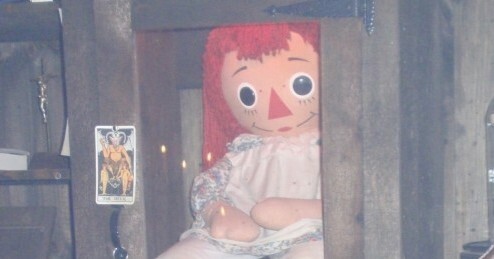 Brereton: I met Rob in the late 90’s. He hired me to do concept art for a proposed film in the Crow franchise for Pressman Films he’d written and was set to direct it. Rob wanted me to illustrate the movie poster, all that. It never got the green light, but we stayed in touch. I did a some art for his first solo album, Hellbilly Deluxe. He invited me to a few shows when he toured for the record, and we had a mutual love of monsters, comics, and Gene Colan’s art. We talked about doing something collaborative with Nocturnals; lots of ideas tossed around. HNN: Will we see more Nocturnals stories in the future? Brereton: Yes. I’m drawing the next graphic novel now. I’ve been working on it since before The Sinister Path came out last summer. I want to get a bit more work done before launching a campaign to fund it, possibly in the Fall. This next story is very fast-paced, very heavy on monsters , all set on one very long Halloween Night, possibly the last Halloween. HNN: You have done illustrations of some of the great Marvel Horror Monsters from the 1970’s. If you could pick any of them, which one would you most enjoy building a new series around? Brereton: I think once you’ve got Count Dracula as your focus , all the other monsters fall into place in his world. I love all the characters from the Marvel Monster Mags, I couldn’t turn down any of them, I’d want to get them all in there. HNN: Any other projects that you are working on? Brereton: As a matter of fact , I worked with the charity, Hero Initiative, on the Nocturnals Anniversary Art Book, which is in the April Previews catalog now , and will hit stores in late June. It’s crazy- we were aided by something like 50 artists in the making of the book, all contributing new work! The book also features rare pieces and two never-before-reprinted stories. We started work on the book in 2014, around the 20th Anniversary of the debut of the Nocturnals, but I have a hard time pestering my fellow artists- we’re all so overworked as it is- so I was patient, and we took time to make it nice, and because of this , we have a very special volume, with contributions from folks like Walter Simonson, Steve Rude, Howard Chaykin, Bill Sienkiewicz, Stan Sakai and dozens more. Proceeds from the book will help Hero Initiative provide aid and financial support to Comic Creators in need. Much of the work appearing in the book will also be auctioned off, too. I would urge folks to ask your LCS to order it now! Like most freelancers who like to eat, I have lots of irons in the fire. After the Portfolio campaign ends, the real work on that project begins – I’ll have quite a few hand-drawn original art plates and watercolor plates to do. I also enjoy doing private commissions, and once I have a number competed, I’ll compile a new art book. I think I have almost enough now, actually I’ve been talking with Sidekick, the trading card publisher who produced my Creeping Flesh Monster Girls set last year, about doing a second set. Illustrating pages for the next Nocturnals graphic novel will likely take up the bulk of my time. HNN: Thank you for your time today Dan, and we will certainly be looking forward to these upcoming projects! The Nocturnals Art Pofolio is currently available for backing on Kickstarter, and the campaign will close on April 14, 2018. 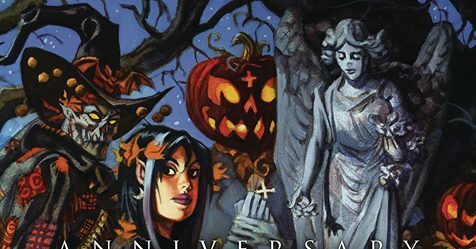 The Nocturnals Anniversary Art Book is currently available for pre-order at you local comic store and will be released on June 27, 2018. To learn more about the charitable work that the Hero Initative is involved in, and to donate, please check out their website here.